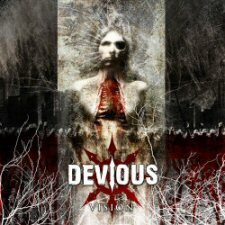 Devious is a melodic thrash band with death metal vocals from the Netherlands and Vision is their third album to date. Anyone who enjoys technical thrash or modern metal from the likes of Testament to Devildriver to Dew Scented will enjoy this; Devious isn't as heavy as these bands, but makes up for that in melody. All the music on this album is extremely catchy and the death metal vocals go along very well with the instruments; production is crystal clear so listeners do not miss a beat. The album opens with ""Heritage of the Reckless" which sounds like some grandiose metal opera. This sets the tone for the rest of the album, although the rest of the tracks are more guitar focused with only a hint of using the synth that is heard so clearly in the first track. "False Identity" has what some could call "math metal" moments in it as one of the guitars tries to play as many notes as possible in a few seconds while being haunted by the synth. "Respiration of Fear" offers some faint, but effective female vocals in the beginning and middle of the track; sadly the music overshadows them entirely so they are not as effective as they could be. "Abide" is more straight up thrash with little synth used. From this point on for next few tracks the music doesn't really offer anything different from what it already has. "Predefined" is the strongest operatic track on the album, offering a strong orchestra in the beginning before the guitars and drums kick in with the screaming vocals, but near the middle of the song things quiet down so they can be heard again. "Validate" holds a difference in vocals; instead of being growled the entire time, they are sung (raspy singing but still singing). For some reason though it feels out of place; the growling is much better. The final track, "Disconnect," pulls everything from the previous tracks together (except the cruddy singing) and throws everything in full, melodic force at the listener. The vocals sound a little worn down, but that's just human, and perhaps a good thing. The music is still melodic and thrashy and the operatic elements add extra flavor. Altogether it is a very good listen, and certainly worthy of any metal fan's attention as Vision has plenty to offer in both brutality and beauty.